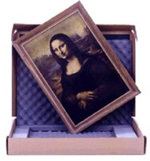 As a distributor for Airfloat Systems, we offer a superior line of inexpensive art packaging products, from foam lined boxes (Strongbox), in a variety of sizes, to pre-manufactured durable flat containers for prints (Printpads). These boxes/containers meet our strictest standards of corrugated packaging. If you need to stock an inventory of these versatile products: Strongbox, Printpads, or Glass Skin for your immediate use, we offer manufacturers direct pricing, quantity discounts, and immediate drop shipping to your location. Global Art Transport clients receive substantial discounts off the listed prices for Airfloat products depending on order quantity. Call 702-365-8136 or email us to request a copy of the Global Art Transport Client Discount Schedule for Airfloat products.